For every weekend since I can remember I have been hoping the weather would be decent and the rivers wouldn’t be blown so we could go fishing. Between prior obligations, getting sick, work and the weather not helping the situation getting out to go fishing just wasn’t happening. I was starting to get pretty bummed out. I just wanted to FISH! We usually always hit the river in our drift boat. The weather had been pretty unpredictable minute to minute for the past week. The rivers weren’t looking the best when we last checked and the weather forecast hadn’t been to accurate. We were still recovering from being sick for the past two weeks and we didn’t want to push our luck. This made us decide to skip on getting the drift boat ready for a run on the river. That left us bank fishing which my husband truly doesn’t care for. He knew how much I had been wanting to get out and fish lately so I was trilled either way. Colton just simply wanted to fish. That kid loves to fish! It was Sunday and we headed toward the coast. We didn’t have a particular spot in mind we were just simply headed to fish! The sun was peaking out through the clouds and despite it being 34* out it was actually a beautiful day. As we traveled to a spot on the river we seen dozens of drift boat trailers. This made my husband regret not getting our drift boat ready and on the river. That regret lasted a few short minutes. As we continued our travel up stream to our destination the number of boats on the water was insane! It was like bumper boats out there. Not only was it free fishing weekend in Oregon the river in which we were fishing wasn’t blown up stream and everyone was taking advantage of the water conditions, beautiful weather and the bite. It’s a common phrase, the tug is the drug, and fishermen were determined to feel the tug. We got to a nice spot in the river. The current was flowing pretty good, the color was okay and there was quite a bit of debris flowing but despite the conditions it looked promising. Quite a few boats and rafts drifted by as I fished from the bank with Colton up stream from me. The sun was shining and it truly was a beautiful day on the river to be fishing. Chris was up steam with Colton fishing and I was a few feet down stream. I was casting across the river and letting my set up float down stream into a nice tail out. Let me clarify one thing here I am new, I mean brand new to fishing anything besides lake trout! I truly had no idea what to expect or do if and when I that tug were to come. I casted out and watched my set up float down river with the current and then… all the sudden my line went tight in an instant. I thought my setup got snagged. NOPE. I had a hard take down from an anonymous Steelie. Now this whole scenario played out pretty fast. I had no freaking idea what I was doing. I said to Chris, “I think I’m snagged, ugh.” As soon as those words escaped my mouth you could hear the drag on my reel screaming at me and my line was running. Chris said to me, “Hold on,” as he tried to part Colton’s side and make it to me. Now if you have ever fished with kids you know it can be a challenge and of course Colton was off in his own little world and had no clue what was going on so Chris trying to step away took a bit longer since Colton wasn’t paying attention. 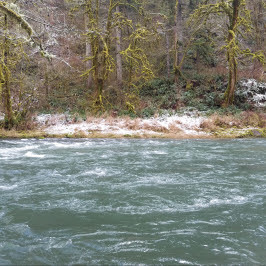 In that short time frame I let slack hit my line and the Steelhead spit the hook and swam off. Chris knew right away when I thought I was snagged that it was a fish but since I am truly clueless and have never caught a Steelhead my knowledge of what to do and when to do it wasn’t there. I truly feel I learn best by doing. So you live and learn. Now I know what the tug feels like and next time I will be prepared to set the hook and keep a tight line. The phrase the tug is the drug has a whole new meaning to it and I can relate to fishermen all over now. All I could do was laugh after the fact. As soon as I said, “I think I’m snagged,” knew I wasn’t as the fish began to run. I didn’t even have a second to attempt to set the hook. I let my line get too much slack thinking I was hung up for the split second before the fish ran and that screwed me.